Catalyst is one year old. It was this time last year that we heard we’d been successful in our application to RCUK to be a Catalyst university. We’re writing our end of year report and the opportunity to reflect on the work we’ve done and the work we’ve yet to do is both satisfying and exciting. A lot has been achieved in year one but there is still a way to go and we’re looking forward to a busy 2013. At the beginning of April we spent a busy three days at the Barbican Centre, London as part of the Wellcome Trust’s Wonder Street Fair. 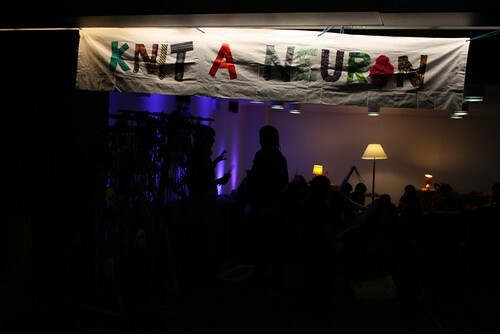 The Street Fair accompanied the British Neuroscience Association’s conference and was a fascinating blend of activities and performance designed to engage the public with neuroscience. You can read a Storify of the event here. Steph Baker (MSc in the School of Psychology, Centre for Clinical Neuropsychology Research), Jade Lyons-Rimmer (in her third year of Clinical Science on placement at the University of Plymouth researching Schwannomas), Jake Ranson and Ruby MacDonald (second year of the Clinical Science) and Kate De-Brunner (Msc Psychological Research Methods) accompanied Helen to facilitate on the Knit a Neuron stall. We had a cosy corner filled with comfy sofas and easy chairs which created the perfect environment for having a knit and a natter. Steph, Jake, Jade, Ruby and Kate were brilliant at facilitating conversations with members of the public and we were delighted when BNA delegates came out of the conference to join us. Our neuroscientists (or “brainonologists” as one girl called them) spent their time talking about memory, brain imaging, mental health, brain physiology and lots more while Helen spent more time talking about public engagement, careers in science communication and how knitting creates as a comfortable, non-challenging space for what can be some quite difficult neuroscience conversations. A big thank you to our neuroscientists, the 5000 members of the public who were willing to join in the conversations and of course the Wellcome Trust, the BNA and the Barbican. Willem Kuyken’s been talking about his mindfulness work with 12 schools on BBC Breakfast. You can see a clip here and read more about the study in this news brief. The deadline for applying for a bursary to attend this year’s BIG Event taking place at Glasgow Science Centre is fast approaching! The bursary provides registration fees for the BIG Event and gives limited travel and accommodation support. This is open to BIG members who are in the first five years of their professional career and have not attended a previous BIG Event. 3: Call for papers: Museum Metamorphosis – deadline for abstracts is 31st May. This conference seeks to explore the phenomenon of metamorphosis – or change – in the museum. Museums are often perceived to arrest time, or go beyond it, yet they are not fixed or static entities. It has often been claimed that in order to become meaningful, museums should change by addressing and responding to the needs of society. Is this the case? Museum Metamorphosis – The Adaptable and Changing Museum will be the fifth conference organised by the PhD community at the School of Museum Studies, University of Leicester, and follows last year’s highly successful Museum Utopias. The conference is open to all museum scholars, researchers and professionals. I have attached the Call for Papers. The deadline for abstracts is 31st May. The Awards are intended to reward outreach work carried out by both young scientists and established researchers in the biosciences to inform, enthuse and engage the public. 5: Nominations for the 2013 Society for Applied Microbiology Communication Award are now open, deadline 14 June. Each award is worth £500 and nominations should be in writing using our online form providing detailed information about relevant media/communications work of the nominee. Nominees will be invited to receive their award at a dedicated event during 2013. Full details and terms and conditions. 6: RSC video competition: Take 1…minute for chemistry in health. Deadline 1 July. PhD students, Post docs (completing their PhD in the last 5 years) and young researchers in industry (including technicians) take part in the new RSC video competition for the chance to win £500, gain some fantastic work experience with an award winning video journalist, and innovate science communication. If you are a young researcher in the UK or ROI, produce a 1 minute video suitable for a non-specialist audience demonstrating how chemistry research can tackle human health challenges. Be as creative and imaginative as you can using sequences, music, visual aids (just to name a few) to create something original and innovative. Please visit the website for full details, more information on how to enter and an example video! if you would like any further information. or +44 (0)117 32 82146 for details of how to apply for the bursaries. Kaleider wishes to commission 2 new pieces of live performance in 2013. Up to £9,000 is available for each commission. Attend this event if you are interested in working with artists to address a future which acknowledges the context of ongoing fiscal crisis, the challenges of climate change, the end of the oil age and peak minerals. All the work we produce will be made with an awareness of this context. This doesn’t mean that the work we commission needs to be issue based or that we want to run a campaign, but we cannot ignore these stories. In order to apply for our commission call you must normally have attended a Kaleider Ideas Lab. The Ideas Lab offers the opportunity to share and craft your ideas (however early stage they may be), as well as meet potential collaborators. It will also be a chance to learn more about our invitation to ‘Imagine a Future.’ You can book your place below. Kaleider creates live performance projects: We make our own work, produce work, commission new work and provide support for artists to develop, push boundaries and take risks with their ideas. A week of events and workshops introducing our Research Toolkit. Research Focus Week will provide you with the opportunity to develop your research skillset and networks and find out more about the services and opportunities available to Exeter’s research community. We’re holding a public engagement workshop on Tuesday lunch. There are different dates and venues depending on your career stage. Further information and booking on the ESRC media training page. ENKDIST (European Network for Knowledge diffusion of Digital Storytelling) is a 36-month long project focused on Digital Storytelling in formal, non-formal and informal learning. ENKDIST addresses ICT’s contribution to digital storytelling as a means of Lifelong Learning. The Network provides advices and support related to the creative use of digital content and to the employment of basic software tools to create digital stories. The project is open to people from the educational and learning sector, from pupils to teachers, from students to professors, from professionals to trainers and adults. The network also started the implementation of the Community of Practice online, created with the purpose to exchange information on DST practices and theories. The community is called dTellers. You are currently browsing the Catalyst blog archives for April, 2013.